Today’s DIY photo collage on wood using photo transfer is brought to you by RYOBI Power Tools. All opinions, project ideas, and thoughts belong to Thrift Diving. 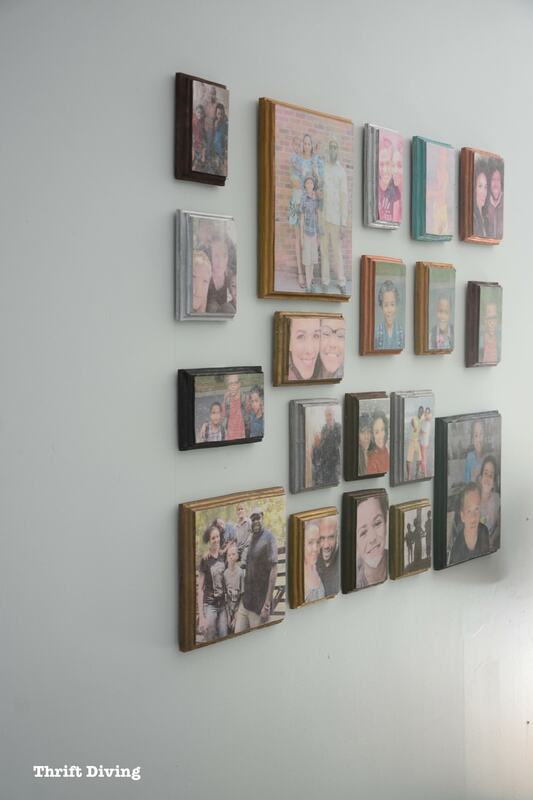 I love this DIY photo collage on wood that I created on my wall recently! But let me explain to you how ironic this is: I’ve got at least 100,000 pictures and videos of pictures stored digitally, and only a handful of the pictures are printed. My walls are generally pretty bare, actually. I’m the woman who snapped so many pictures at a family gathering once that distant relatives at the event had thought I was from the local newspaper (not kidding; this actually happened). But getting them off of the camera and out of the external hard drives is something at which I have sucked. This month, though, I’m beaming over my latest RYOBI Nation project: a DIY photo collage on wood using photo transfer medium! (Click here to get the full-tutorial for this project). I am a RYOBI Nation Partner and at various times throughout the year, I get to collaborate with them on projects that force me to think outside of the box while using power tools. So this month, the challenge was to think of creative ways to display my pictures. As much as I love thrift stores, thrift store picture frames weren’t creative enough. I’ve got a lot of scrap wood lying around, so I decided to try my hand at photo transfer onto pieces of that scrap wood. The result is a fun little photo collage on wood! Click here to get the full tutorial on how to create a photo collage on wood! I am sure I left a few people out, but that’s what great about having a big wall and using scrap wood–I can expand it very easily! The tutorial for how to create a photo collage on wood is over on RYOBI Nation for their “Picture This” theme this month. Click here to access step-by-step instructions: How to Create a Photo Collage on Wood Tutorial. What prize do YOU most want to win this month?? 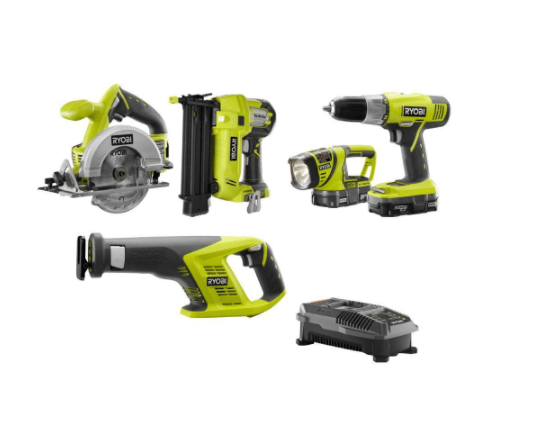 If you enter below, you can win $300 in RYOBI power tools–you get to decide what you want to win! How awesome is that?? 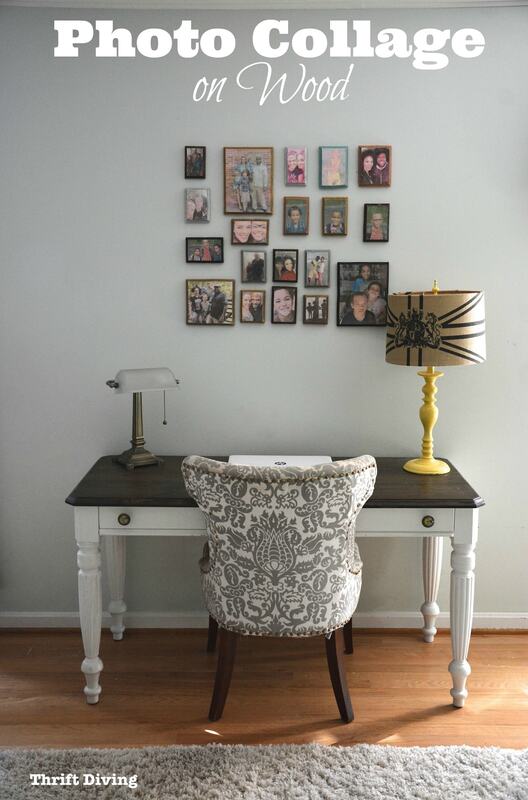 Leave a comment below and tell me how you have creatively displayed pictures in your home. 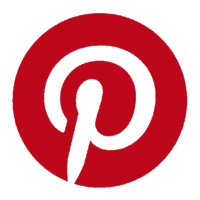 BONUS: Pin this project on your Pinterest boards! « Join the November Room Makeover Challenge 2017! I love this project idea. Currently we use store bought photo frames throughout the house and it would be great if we had a custom show piece like this. I’ve made suncatchers with photo’s using plastic squares, clear self adhesive paper, drill holes and hang with ribbon! Rainy day project! Love the look but I don’t have the tools. Sadly, most of the pictures are still on my computer, a few are printed for individual frames or put in a collage frame. Thanks for the opportunity to win ‘my’ choice of tools!! I have the opposite problem, too many photos not enough walls, lol. I love this project, will have to try it some day. Thanks for all you tutorials. I bought my Ryobi tools because of you, but I would love to have more.